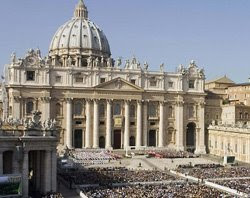 "The lifting of the excommunication has freed the four bishops from a very grave canonical penalty, but has not changed the juridical status of the Society of St. Puis X, which currently does not enjoy any canonical recognition in the Catholic Church. In addition, the four bishops, while they are no longer excommunicated, do not have a canonical role in the Church and do not licitly exercise a ministry in her"
Pope Benedict has opened the door to full reconciliation. The Society of Pius X should now respond with equal generosity for the sake of unity. However, entrenched positions are no so easily relinquished. One of the things I note in these last few weeks is how generously the Traditional Anglicans have expressed their acceptance of the Catholic Catechism and their willingness to move towards full unity with Rome whilst the Lefebvrists have actually expressed nothing except acceptance of the lifting of excommunication. This is not enough. They must now take the initiative and move towards the Holy See. At the moment it seems they are not ready to do this. tell the truth about the history of Jews and others that at the hands of the Nazis. Is the Unity of the catholic church more important the destruction of six million Jewish Lives. If we look at the chonology of the events, we can see that Bishop Williamson did not make his views widely known until the Vatican had already decided to revoke the excommunication. His interview (with Swiss TV? )came out of the blue as far as the Vatican was concerned and caused great embarassment. We can see that there was a rush then to ask how the Holy See might respond. I think the Vatican has done its best given the speed required and the difficult situation of the SSPX.